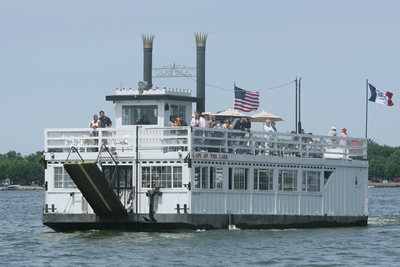 Lady of the Lake offers passengers a picturesque ride on Clear Lake. If you’ve seen the stage production or the popular motion picture The Music Man you know that although the production sings about “trouble right here in river city,” it’s good old fashioned standards and plenty of citizen aggressiveness that make all come out well in the end. That can be your achievement—all coming out well as you take a trip to the town that inspired the Warner Bros. motion picture The Music Man—Mason City, Iowa. Mason City is the hometown of Meredith Willson, the internationally renowned composer and creator of The Music Man, as well as the setting for his musical. One of the first places you will want to visit is Willson’s boyhood home, where he was born and spent the early years of his life soaking up middle American culture. Then travel back to 1912, at the Music Man Square, where you will step into a streetscape with its ice cream parlor/soda fountain and other nostalgic places made famous in the Warner Bros. production. Here you will find Willson memorabilia and items related to his creative musical career. Willson also wrote the musical The Unsinkable Molly Brown, which became a Broadway success in 1960. His other compositions include Seventy-Six Trombones, It’s Beginning To Look A Lot like Christmas and May The Good Lord Bless You And Keep You. The streetscape is free but there is an admission to the museum. In the museum, you will see the importance of music in Willson’s life and to all American culture. You will enjoy exhibits ranging from Civil War bands to Victorian parlor music to swing bands. Also included is a replica of the studio in his California home and the actual piano on which he composed many of his hits. Another well-known entertainer grew up in Mason City—Bil Baird who was a master puppeteer. His shows appeared world-wide, at world’s fairs, in motion pictures, and on numerous television programs. You’ll see a large collection of his work at the Charles H. MacNider Art Museum in Mason City, including the puppets featured in the motion picture The Sound of Music. Besides puppets, you will also find American art, a range of ceramics, films, and special events at the museum. At the local airport, the Kinney Pioneer Museum lets you experience life on the Iowa frontier. Here, visit a one-room school house, blacksmith shop, old jail, and if you drop in on weekends, you’ll see demonstrations of pioneer crafts and trades. As much as you will enjoy these attractions, there is much more at Mason City than just museums and the magic of a mighty motion picture. Here you will also find the last remaining hotel designed by famed architect Frank Lloyd Wright. Six hotels were designed by Wright and Mason City claims the only one still standing. The hotel is undergoing restoration during 2009 and is slated to be completed by the end of 2010. Wright’s designs were the most famous of the Prairie School style of architecture popular in the late 19th and early 20th centuries and common to the mid-west. You can visit Wright’s residential home where a new architectural interpretative center is expected to be completed by June 2010 to help visitors understand this unique style of design. It is just north of the National Historic District, which is the largest collection of Prairie School designed homes on a unified site. You can tour a residential home and watch a slide show of Prairie School design. Mason City has a myriad of things to intrigue, entertain, and attract you. For a nostalgia moment, if you are a devotee to the world of music, over by the airport you will find Clear Lake and the Surf Ballroom. This is the final performance location of Buddy Holly, Ritchie Valens, and “The Big Bopper” Richardson before their fateful trip on February 3, 1959. Also at Clear Lake, wander through the nearly two acres of Fort Custer Maze, which replicates an 1850 Western fort. There are bridges, a lookout tower, a one-of-a-kind wooden maze, and eight sections to help you find your way out if the twists and turns are too much for you. You know with the name of Clear Lake, the community must be near a body of water. From mid-May through September a picturesque paddlewheel boat offers dancing to live music or a relaxing evening sitting and admiring a beautiful sunset. About 25 miles north of Mason City you can try your luck at the Diamond Jo Casino at Northwood. The casino features more than 900 slots, black jack, craps, roulette, and pai gow poker. Mason City is the home of the Iowa Traction Railroad, the last remaining electric freight-hauling railroad. There is a good chance you will get a glimpse of this one of a kind train if you travel along 19th Street SW, which runs parallel to the tracks. Your visit can be either one of self exploration or a series of guided tours. Along one of the tours you will cross “The Meredith Willson/Music Man Footbridge.” It crosses Willow Creek and was named to honor one of the city’s most prominent citizens and to recall the bridge so prominent in the musical. Band music in Mason City began gaining popularity in 1928 when the first North Iowa Band Festival was held to commemorate the town’s 75th anniversary. The city still hosts this annual event honoring the musical culture and the townspeople still feature bands for the youth as The Music Man’s Professor Harold Hill fostered. In The Music Man, Professor Harold Hill brought music and joy to the people of River City. Today, the people of Mason City can bring music and joy to visitors. Mason City is in America’s heartland about half way between Des Moines and Minneapolis/St. Paul, approximately a two hour drive from either spot. It is not far off Interstate 90. Two regional airlines serve the Mason City Municipal Airport. Nine inns and one bed & breakfast offer convenient lodging and various rates, all relatively close to the airport and center city. Decker House bed & breakfast is in an historic house constructed in the 1890s. Rates will vary from $85 to $175 per night. Make your reservations before you go through WTA’s Online Travel Booking Service at www.worldtravelers.org/travelservices.asp. Significant hotel and car rental discounts may apply. Choose anything from fast food, to bar and grill, to fine Midwest dining at any of the nearly 100 restaurants in Mason City. Although far from any coast, Mason City offers several fine steak and seafood establishments.